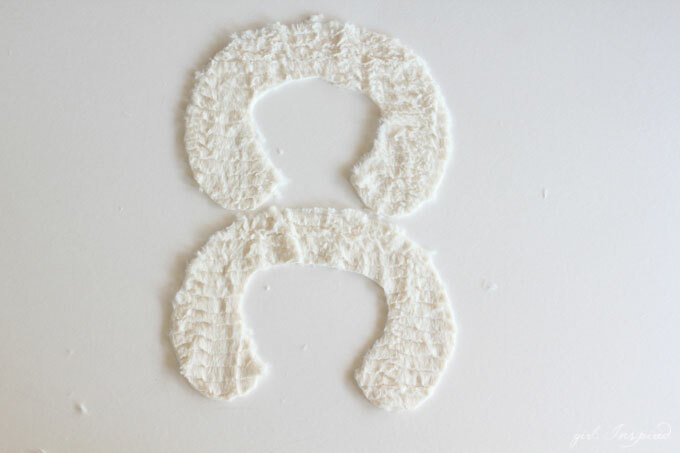 With the winter chill in the air, it’s time to warm up with plush fabrics and warm whites. The holiday outfit that I’m sharing today is the perfect combination of fabric and color to keep a smile on our faces throughout the season! A couple years ago, I made my youngest daughter a simple snugly swing coat and it has been our winter go-to every cold day since! 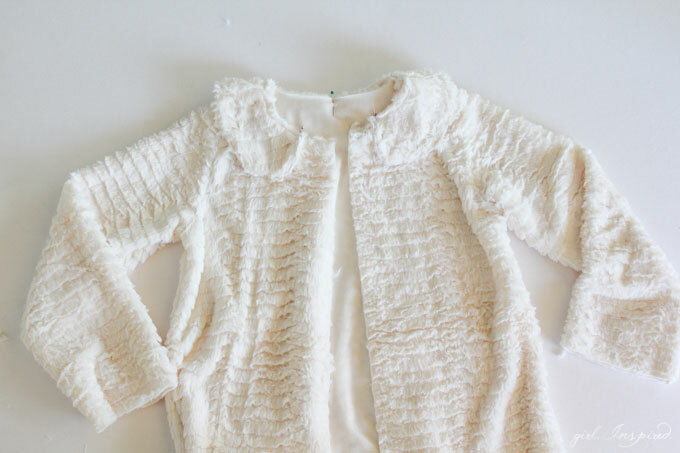 My other girls have been begging for their own furry coats, so today I’m sharing the pattern and instructions for this luxury fur coat in sizes 2T-8. Before we get into the how-to, I wanted to share a few general tips and bits of information. There are a couple types of faux fur available. 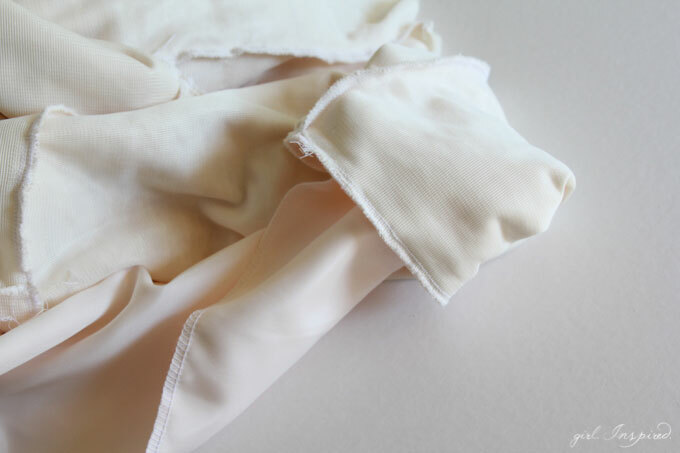 One type has a much stiffer fabric backing and it is less flexible for a finished garment. 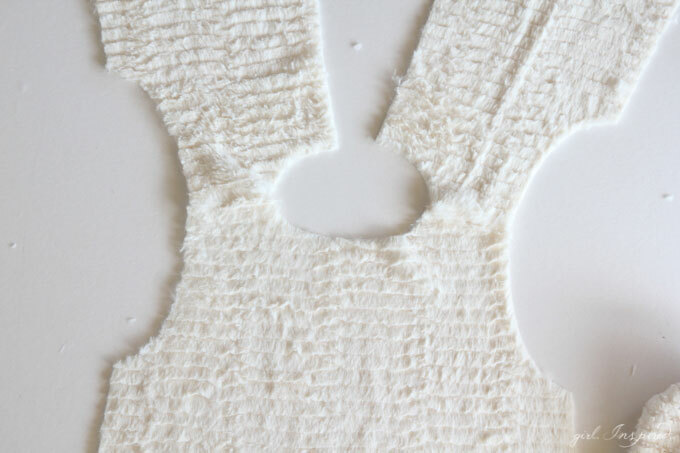 The other type has a really soft backing fabric – the “fur” is plush and soft and the piece of fabric as a whole drapes and flexes much better for this particular pattern. You can choose from various “soft and comfy” fabrics or I have an online link for this specific “luxury faux fur” in the supply list below. I used a serger to make almost this entire coat. 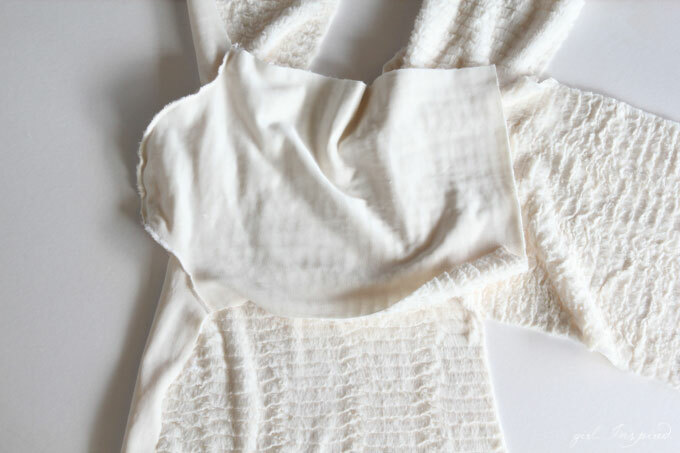 A serger is not necessary, but the fabric is really bulky and slippery and I find it much easier to run the pieces through the serger to get everything stitched together quickly and adequately. Thirdly, keep a vacuum handy! 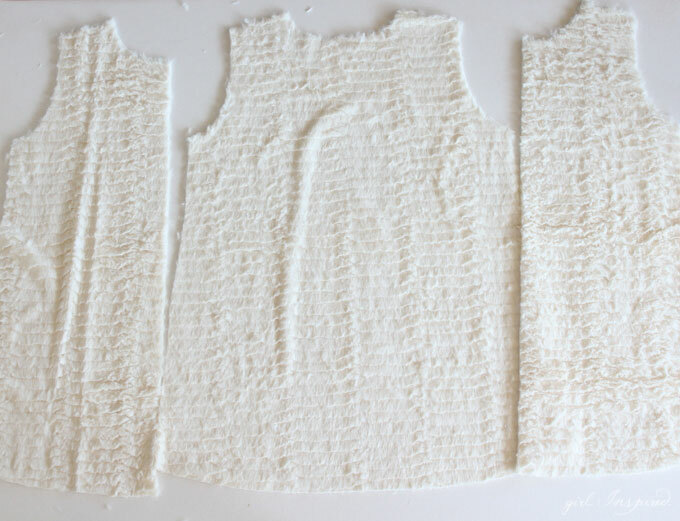 This stuff sheds everywhere and your sewing room will look like a snowstorm hit, but the finished product is totally worth it. Once the raw edges are sewn together the shedding stops, so just keep that vacuum nearby for clean up and you’ll be fine. I like to use the same fur for most of the lining (I use a satin for the sleeves because it makes it easier to slip them on). You can use an alternate lining, like a satin, for the whole interior of the coat but it will take a bit more precision and topstitching to ensure that the lining doesn’t show on the exterior coat. 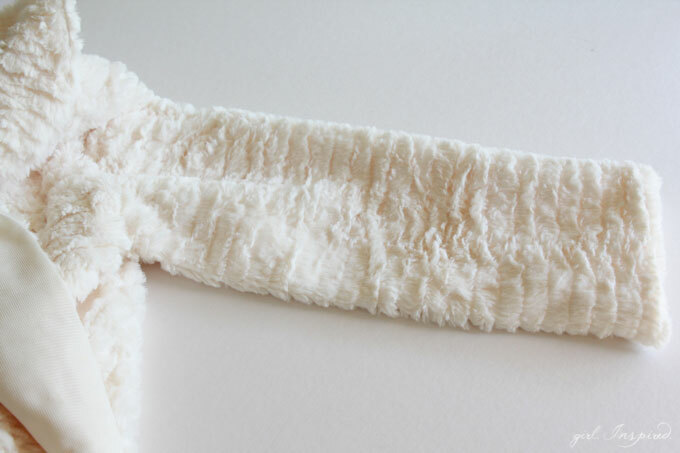 Finally, if you use a cuddly fabric that needs to lay in a certain direction (i.e., this white faux fur has horizontal lines and each strip needs to lay downward), try to smooth down the fabric as you are stitching. Print and assemble pattern and cut out desired size. Using the pattern, cut one back piece and two front pieces (one right, one left), two sleeves and two collar pieces for the exterior from the faux fur. Cut one back piece and two front pieces (one right, one left) from the faux fur for the lining. Cut two sleeves from the satin fabric for the lining. 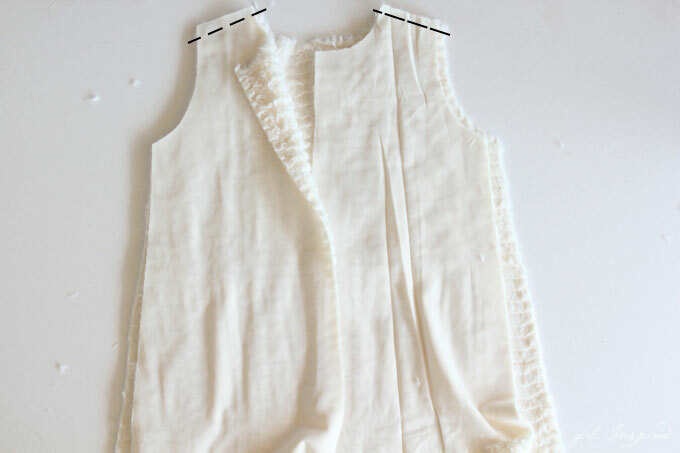 Sew the two front pieces to the back at the shoulders, right sides facing. 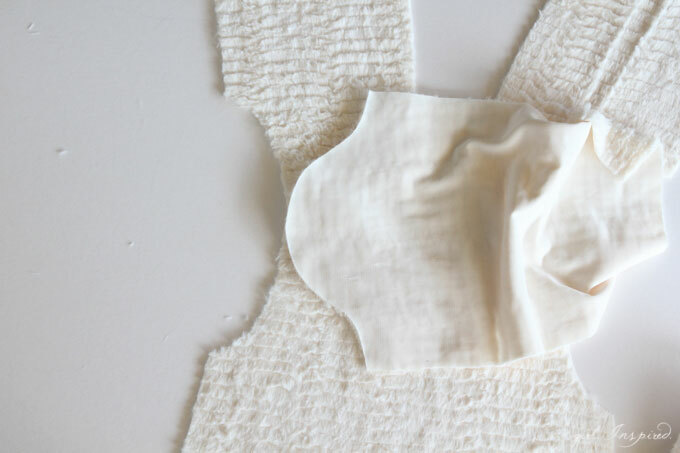 Use a 1/4″ seam allowance (perfect for serging). Repeat with the lining pieces. Place coat exterior opened up with right side facing up. 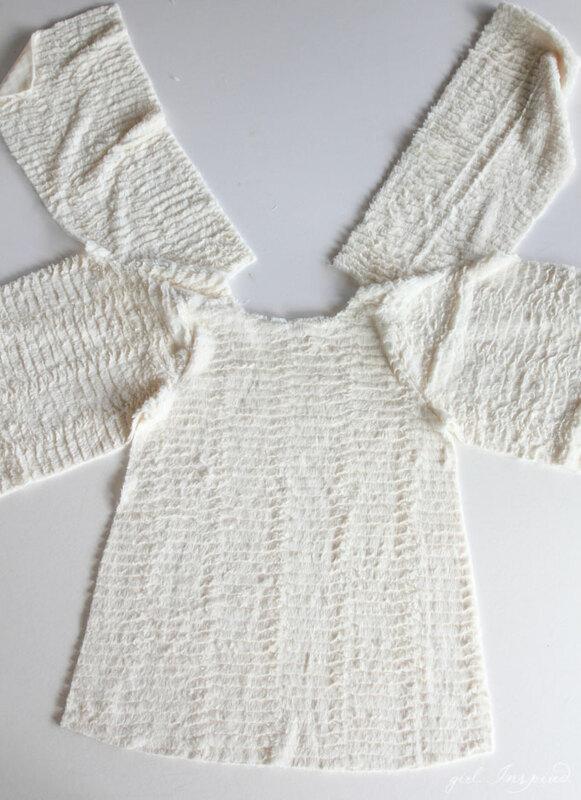 With right sides together, match the center top of the sleeve piece to the shoulder seam of the armhole. Fit curve of the shoulder into the armhole and pin together. Sew. Repeat for the other sleeve and for the lining. 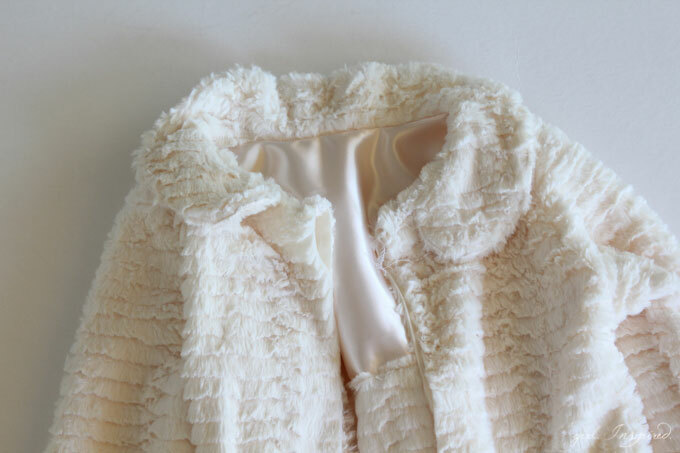 Fold the coat right sides facing, matching the raw edges of the sleeve and the sides of the coat. 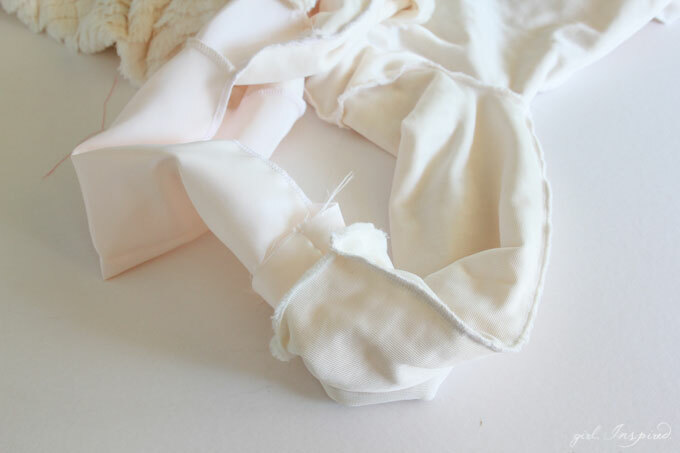 Sew from the cuff toward the underarm, pivot and continue sewing down to the hem. Repeat for both sides of the coat and for the lining. 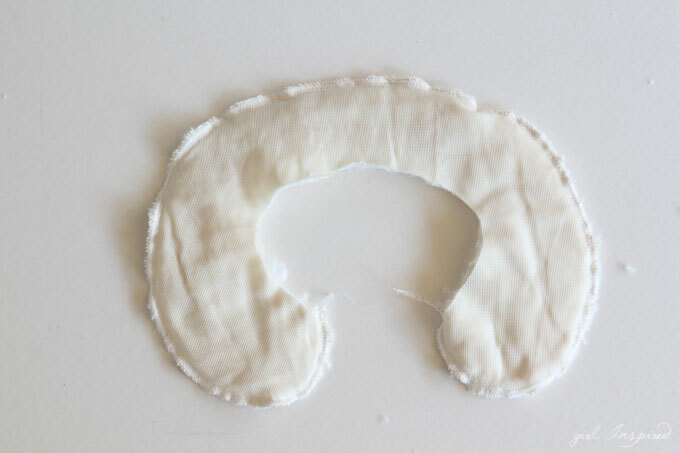 NOTE: When sewing up the side seams of the lining, leave a 4″ space along one side seam open – this will allow for easy turning of the finished coat later on. 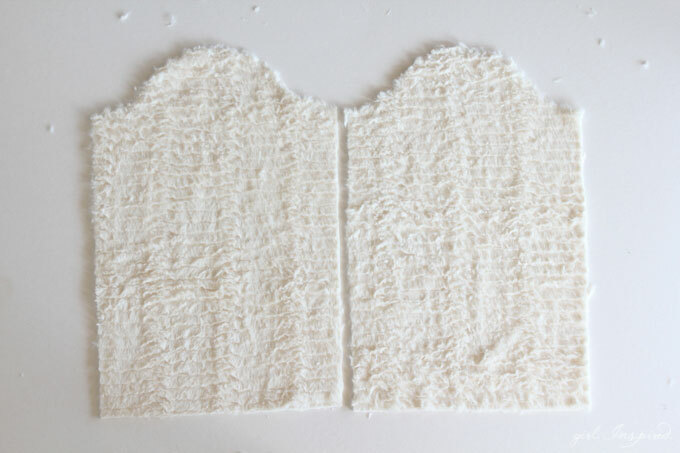 You will now have two coat shells, the main and the lining. Match the two collar pieces, right sides together. 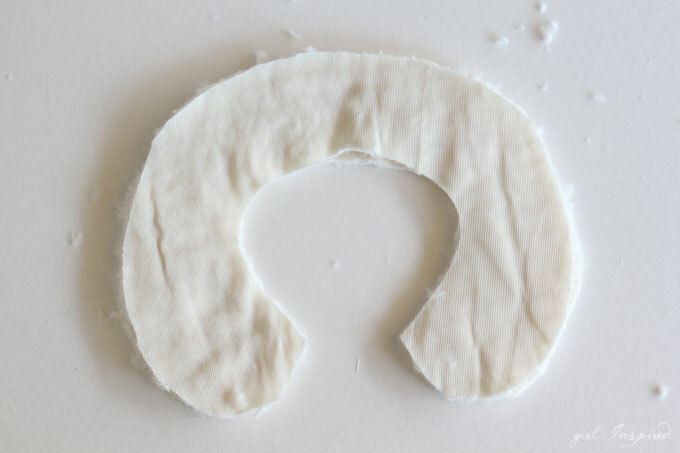 Sew around the outer curve. Turn right side out and run your finger along the seam from the inside to ensure that the collar is fully turned and shaped correctly. Topstitch along the outer curve, close to the edge. 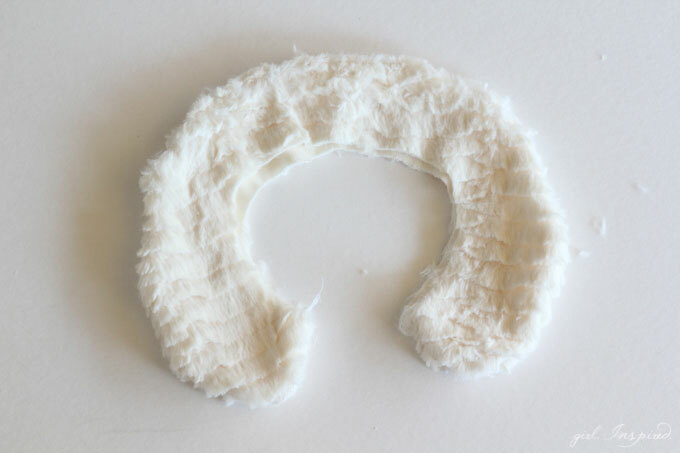 Trim any unevenness on the inner curve between the upper and under collars. Baste the raw edges of the inner curve of the collar together. Match the center of the collar and the center back of the main exterior coat. Pin the collar around the neckline and baste into place. With the main coat right side out and the lining turned inside out, match the raw edges of the two necklines and pin together. Sew the exterior coat to the lining around the neckline, ensuring that you catch all the layers in your stitch line – the exterior, the lining, and the collar. Turn the coat right side out and check to be sure the neckline is stitched correctly and completely. Slip the sleeves of the lining into the sleeves of the main coat. 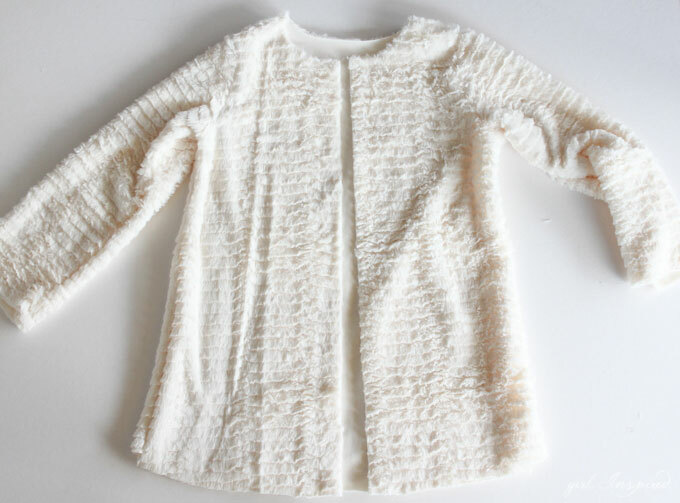 Try the coat on the child and check the sleeve length and overall length. 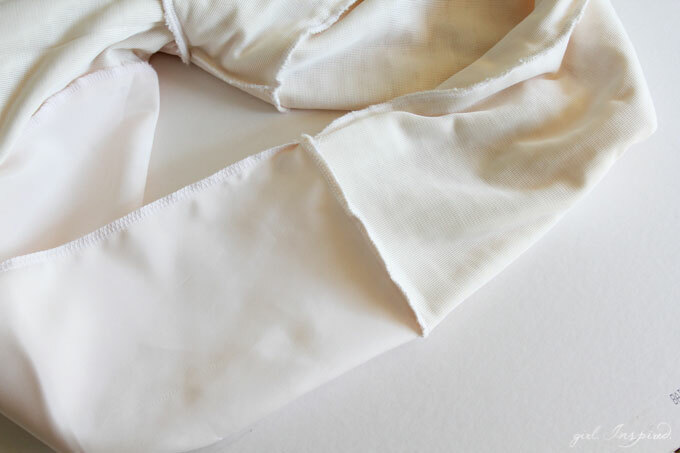 Trim the sleeves to one inch below the desired finished sleeve length. Time to stitch the sleeve hems. 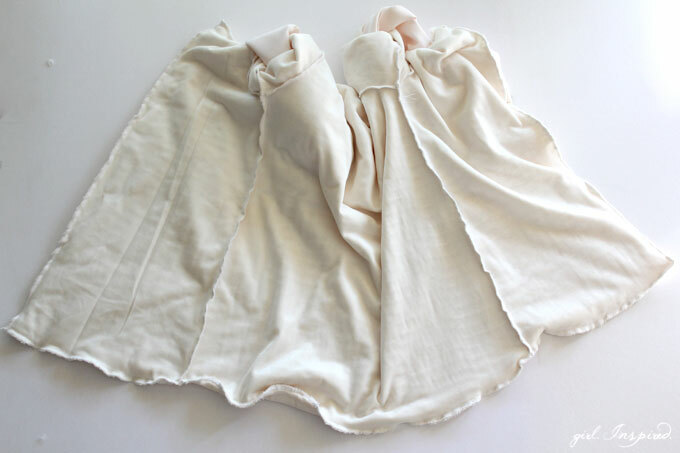 Fold both the lining and the coat inside out and separate the main sleeve from the lining, as shown in the picture above. 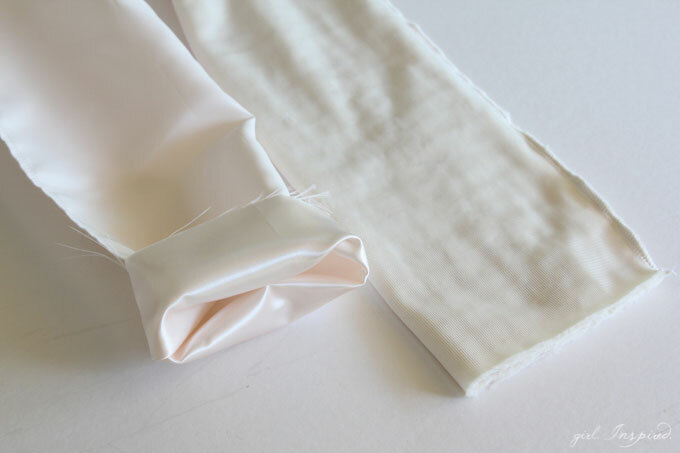 Trim 3/4″ from the lining sleeve (this will ensure that the lining is pulled to the inside of the coat sleeve and give a nice, professional finish). Fold up the raw edge of the lining sleeve, as shown. 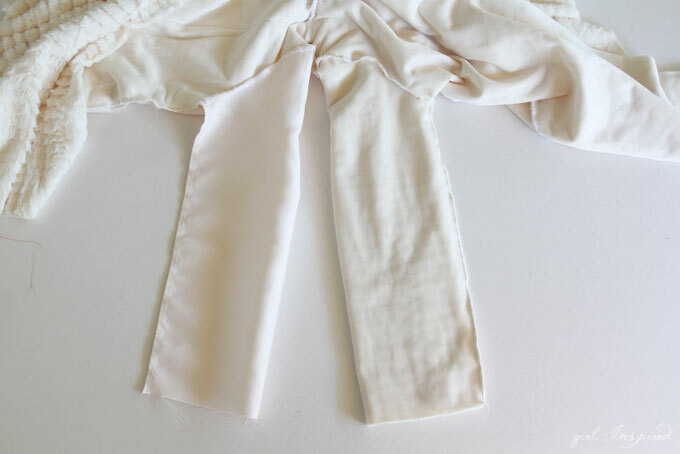 Ensuring that the sleeves are not twisted and lining up the underarm seams, slip the exterior coat sleeve over the folded cuff of the lining sleeve so that the fabrics are right sides together. Stitch the raw edges of the sleeve and lining together, going all the way around. 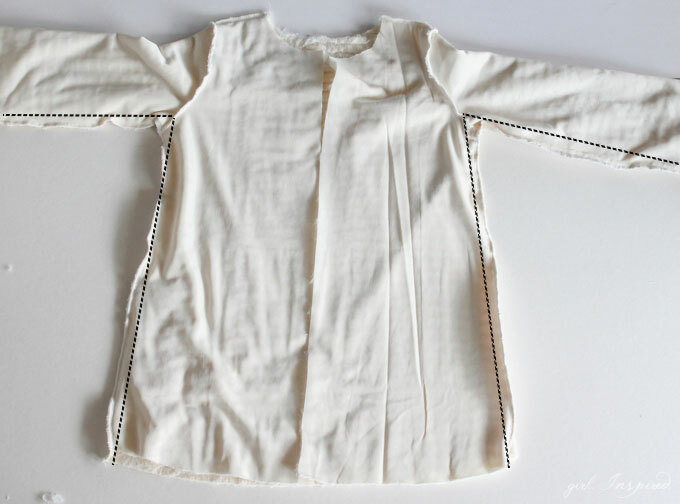 Now, turn your coat right sides out and the sleeve and lining will be perfectly connected. Repeat the same steps to attach the other sleeve and lining. Now it’s time to finish off the coat! Fold the whole ensemble inside out once again, matching up the top corners of the front pieces to the lining. Match the seams along the bottom hemline (the side seams). You can pin the exterior to the lining if you want or simply pin at a few key points. Now stitch all the way down one front seam, all the way across the hemline, and back up the other front piece to the neckline. Pull the entire coat through the opening that you left in the side seam of the lining and your coat is almost done! Stitch up the turn hole in the lining. Topstitch, close to the edge, along each front flap for a crisper finish to the faux fur (this is optional). 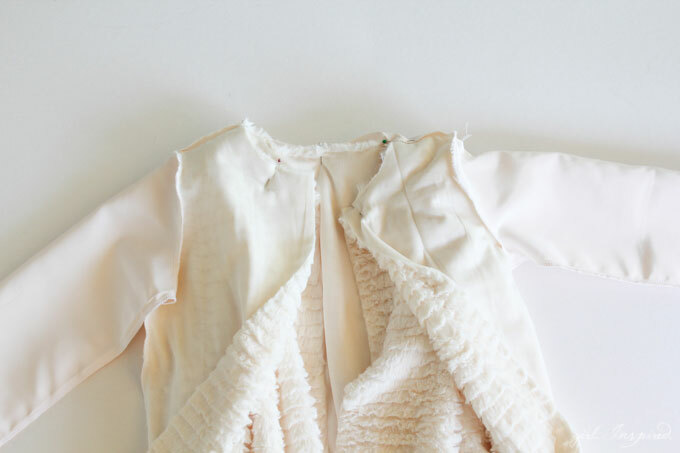 Add a hook and eye at the neckline for clasping the front of the jacket closed. Add two large decorative buttons if desired. (Note: you should have enough overlap along the center front to add buttons and buttonholes if you desire). I simply can’t get over how cuddly and warm this coat turned out. 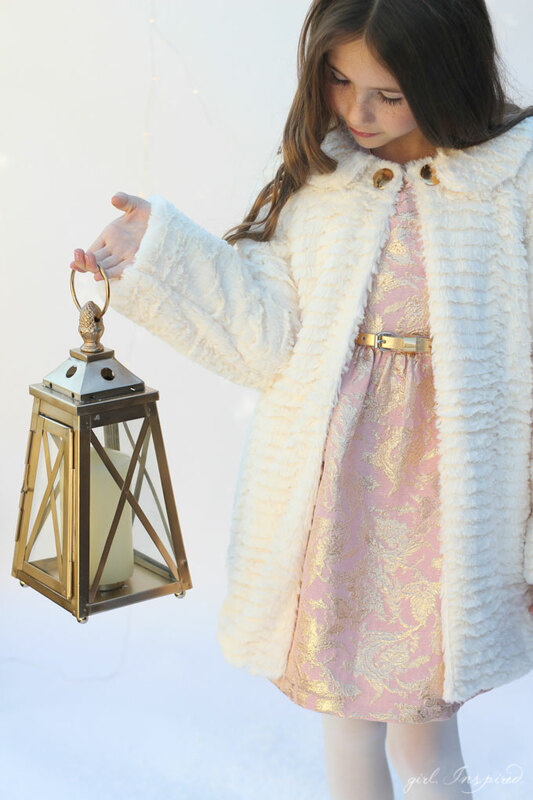 Between the creamy white fur and the pink and gold coordinating dress and accessories, it’s absolute winter perfection! Hop over to Girl. Inspired. to get the full scoop on this coordinating Christmas dress! Thanks for hanging with me today! I hope you have a wonderful and fulfilling holiday season!